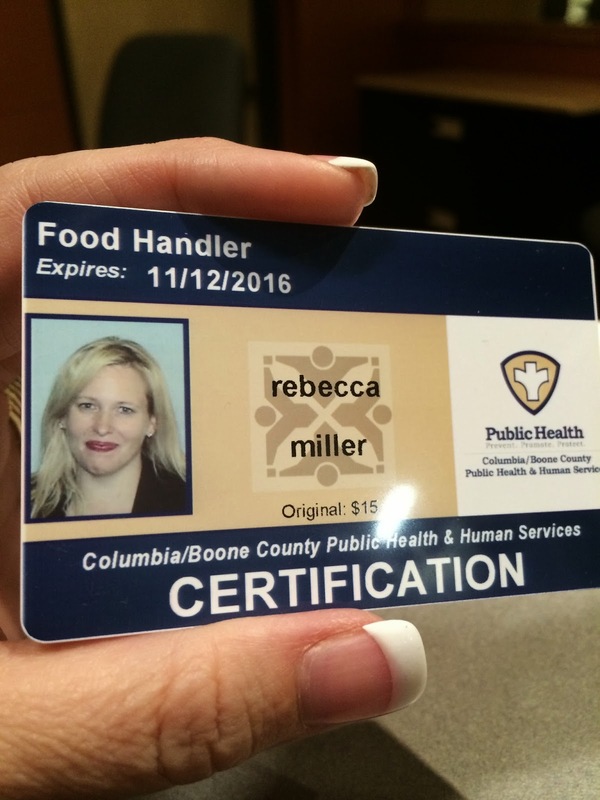 So, last night, we both attended the Columbia, Missouri food handlers class. Did you know they give you a test at the end of the one-hour class? They do. But in good news, we passed. 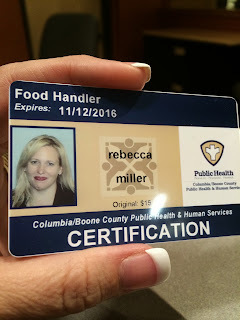 And while I don't mean to make you super jealous, I would be remiss to not show you the payoff of watching horrifying undercover food safety videos. In other important but mundane items, today we went to get our City of Columbia business license and it turns out you need a lot of information that we didn't have with us (primarily the Missouri sales tax identification number). It also takes at least 10 days to get the business license once you turn in the application and fees (oh so many fees). We started to mildly impact how this development would impact our Thanksgiving pie baking plans (no business license = no pie selling). Then, we learned we only need a temporary business license for selling Thanksgiving pies since we will be operating out of a temporary location for our baking. The Elks Lodge is actually in the county and not the city, and so that involved going to from the City of Columbia office to the Boone County Government office and starting over with a different application and different information and different rules. However, once we have our tax identification number, it only takes "seconds" to get the temporary permit from the county. (Someone at the city should talk to someone at the county about the 10 days vs. seconds). Some entrepreneurial person out there should open a business based solely on completing all the forms a person needs to open a business. That person should not be easily annoyed by senseless rules or get headaches easily. Let's all hope for an answer tomorrow that moves us forward. If Contractor Steve can get the go ahead, then the permit train can leave the station, and eventually construction can start. I also found out today that the health department has to do an inspection, as does the fire department. My new hope for our open date? December 11th. The ball is in your court, Kroenke.